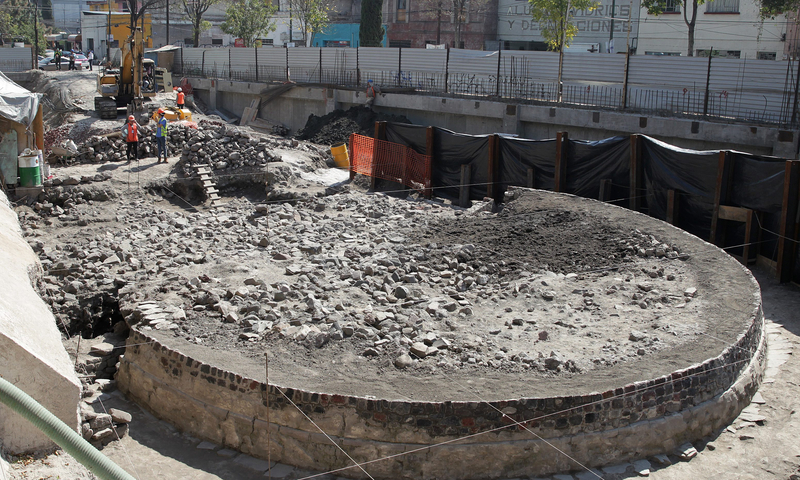 Archaeologists have discovered a 14th century temple to the wind god under a supermarket in the Tlatelolco neighborhood of Mexico City. The supermarket was demolished in 2014, and archaeologists from the National Institute of Anthropology and History (INAH) excavated the site. That first excavation dug down three meters (just under 10 feet), revealing the top of a circular platform, pottery fragments and 20 burials of adults, children and animals. The second excavation season began in March of 2016. It unearthed the full platform 11 meters (36 feet) in diameter and 1.2 meters (four feet) high. It’s more than 650 years old, but the original stucco still covers most of it. 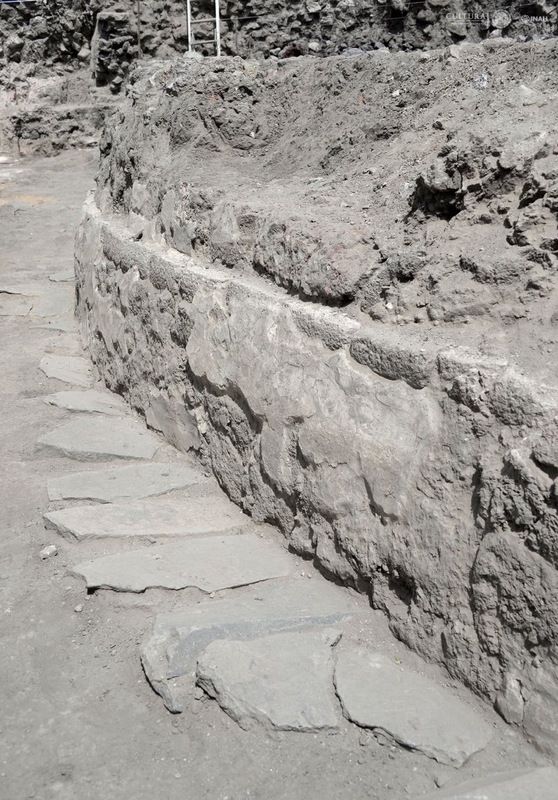 At the eastern entrance of the temple, a cist burial and another seven human burials were discovered. In total, archaeologists found eight complete skeletons (six infants, two adult women and one adult man) and the incomplete remains of seven individuals identified from disarticulated skulls, femurs and other long bones. In the cist burial archaeologists found the skeletal remains of a newborn infant, bird bones, a mound of obsidian shards and arrowheads, agave thorns, copal resin and green stone. Other artifacts found at the site include incense burners, ceramic figures of monkeys and duck beaks. These figures are associated with the god Ehecatl-Quetzalcoatl, creator of precious rain-bringing wind after long droughts. The shape of the temple also supports a link to the wind god. It is circular on the north, south and west sides. The entrance on the east side has a rectangular conversion which matches in design and orientation a temple dedicated to Ehecatl-Quetzalcoatl that was discovered at the entrance of the archaeological site of Tlatelolco. Also, the fronts of temples dedicated to Ehecatl-Quetzalcoatl always face east. There is evidence the temple was built in the three phases. The first dates to the years right after the founding of the city in 1337 and is characterized by inclined walls, the only ones of their kind among the archaeological remains of the area. The second stage of construction went on between 1376 and 1417. The bulk of the platform as it stands today was built during the second phase. The third phase (around 1427) is compacted earth around the building. It’s possible this is not a 15th century feature, but rather was caused by the construction of the supermarket in the mid-20th century. The two seasons of excavations discovered around 43,000 artifacts, 1000 of which were recovered and fully documented. They are currently being studied. Even as a shopping center goes up behind it, the temple will be preserved and covered with protective glass so visitors to the archaeological site of Tlatelolco can view the platform without damaging it. Tlatelolco was an independent city-state before the Spanish conquest. It was a regional center of commerce with a major market. Its larger neighbor Tenochtitlan was the political and administrative center and depended on Tlatelolco market. Both cities were built on an island in Lake Texcoco, Tlatelolco on the northern part of the island, Tenochtitlan on the south. Tensions and rivalries between the two cities exploded into war several times in the 14th and 15th centuries, until in 1473 Tenochtitlan conquered Tlatelolco. When conquistador Hernán Cortés and his indigenous allies besieged Tenochtitlan from May to August of 1521, the starving and diseased survivors moved to Tlatelolco where they made their last stand against the Spanish conquest. This entry was posted on Wednesday, November 30th, 2016 at 11:14 PM	and is filed under Medieval. You can follow any responses to this entry through the RSS 2.0 feed. You can skip to the end and leave a response. Pinging is currently not allowed. Wasn’t even a Supermarket, it was a car park. Amazing that ruins are now being incorporated into the building instead of being wiped away after the dig for the new construction. I thought it was a car park for a supermarket. No, ironically it was the parking lot for the city services building. Even worse he was directly under the R in Parking area painted on the Tarmac. Rather X marks the spot.